Sometime around 1988 my wife Marge and I were looking for a CPA to do our yearly tax returns for the upholstery shop. Way back then, the only way to do a search was to pull out the Yellow Pages and scroll down the Certified Public Accountant listing with your finger. For some reason, one ad from a CPA named Colleen Degnan-Daley seemed to spark our interest. The only drawback was that Colleen was in Plymouth, MA and we were in Yarmouth Port, MA. That meant a forty five minute drive for us to make contact. So Marge and I gathered all our files and went to meet Colleen. We liked her right away. She had a home business like we had and she was very easy to talk to. We really felt Colleen wanted to give us every legal advantage on our upholstery business and individual tax returns. It was official…Colleen Degnan-Daley became our CPA. So several years go by doing business with Colleen between Plymouth and Yarmouth Port. In 1990, Marge and I moved to South Dennis, MA, where we could operate the home business. We received our yearly tax organizer in the mail — Colleen sends this out every year for our income and expense totals. Included in the tax organizer were directions to Colleen’s new office in Harwich. That’s the next town over from us on Cape Cod! We really felt that a good friend and business confidant had moved to our neighborhood. Several more years go by. This year our tax organizer came with directions to Colleen’s new office in South Dennis, MA – of all places! Literally and physically a two minute drive or five minute bike ride. The original ad we saw for Colleen some twenty years ago must have had some magic to it for us to eventually end up in the same town. • Obviously I think Colleen Degan-Daley is the best certified public accountant you can get for your business or personal needs. She does full service business accounting as well as tax returns. If you’re looking for a CPA, give Colleen a call at her new South Dennis office at 508-432-3868. • When Colleen and I met, email was not commonly used, texting had not been invented and it took several floppy discs for me to print out an invoice. • Some people consider Plymouth as Cape Cod. Others consider Cape Cod as being east of the Sagamore and Bourne bridges. The old maps from the 1600’s and the days of the Pilgrims certainly showed Plymouth as part of Cape Cod. But I think the modern standard for Cape Cod is anything east of the bridges. I’m excited to announce Novus foam is now available to my customers at Cape Cod Upholstery Shop. Novus is a hybrid foam that combines the use of natural seed oils like soy, sunflower and castor. The natural oils replace some of the petrochemicals used in making traditional polyurethane foam. According to the manufacturer, Novus foam requires less energy to produce, which in turn reduces it’s carbon footprint. Novus performs to the same high standards as tradition high density foam, is hypoallergenic, meets the California B117 fire code and is available in soft and medium compressions. Joe Gramm has registered the domain name Cape Cod Upholstery. There are many businesses on Cape Cod with Cape Cod in their name. So I was quite surprised to find that a name as basic as Cape Cod Upholstery was still available. So I couldn’t resist registering the domain. I think the domain was still available because a lot of upholstery businesses are named after the proprietor. For example, Joe Gramm Custom Upholstery. I think it’s fair to say that after thirty-eight years in the business, I’ve thought a few times about retiring from upholstery. Most of the worth in my business is some equipment and a goodwill factor with a large established client base. If someone were to take over my business, I thought they may want to operate under a name like Cape Cod Upholstery. So slowly over time, I’ll be changing the name over to Cape Cod Upholstery. You, who are reading this on Upholstery Blog, are the first to hear the official story of how Cape Cod Upholstery came to be. The one man upholstery shop survives another year. That makes thirty one of them in a row! And I’m only fifty four years old. 2009 might have been the toughest and most interesting year of them all. The tough part was not having much of a backlog of work throughout most of the year. A few times I ran out of work and once I had a two month backlog. That’s a tough business environment. The interesting part was how the Internet became my business lifeline. 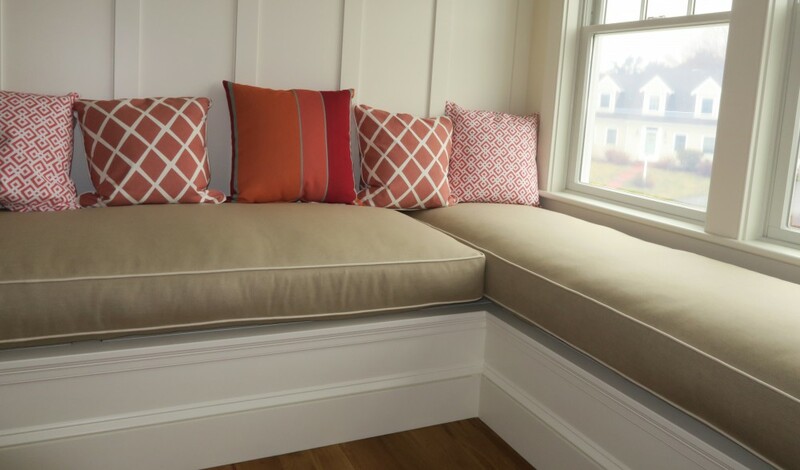 With the help of all the search engines, Google and Yahoo Local, Merchants Circle, and Upholsteryblog, Joe Gramm Custom Upholstery has become an easy place to find on the Internet for upholstery on Cape Cod. Another interesting change in the business in 2009 is the younger customer base I’m developing. In 1990, my customer base was fifty to eighty years old. In 2009, my customer base has widened to thirty to eighty years old. An expanding customer base is a welcome surprise. Thank you to all my customers who trusted me with their furniture and all who visited my sites and asked questions. I even managed to have some fun in between. Ultimate Frisbee and the beach were my favorite outdoor activities. I even mixed Ultimate with business by coordinating estimates with Ultimate Frisbee pickup games from Wellfleet to Falmouth. I had a lot of quality time with my family and expanded my knowledge of photography for both business and pleasure. I hope 2010 will bring new and exciting possibilities for the upholstery shop. My business New Years Resolution is to bring the use of video into my work as well as a shopping cart at joegramm.com for specialty, upholstery related items. If the economy can achieve a sustainable recovery, 2010 could be the greatest year ever for this one man upholstery shop on Cape Cod. The Ultimate Frisbee upholsterer that is! Sometimes I combine Ultimate with an upholstery estimate or delivery especially if they’re near Falmouth or Wellfleet, both of which have great Ultimate. Falmouth and Wellfleet are about forty minutes away from Dennis, so it works out well when I can complete the Ultimate estimate. In comes a call for an estimate in North Falmouth. So I set up the Ultimate estimate before our night game under the lights in Falmouth. I arrive at my customer Scott’s house. I do the estimate and everything goes well. As I make my way out, Scott accompanies me to my van and we chat a while. The topic comes up that I’m on my way to play Ultimate. He suddenly scoots back into the house and returns seconds later with a frisbee. Not just any frisbee, a Lady Godiva frisbee. Lady Godiva is one of Boston’s premier women’s Ultimate Frisbee teams, winning more championships than any other womens team in Ultimate history. It turns out that Scott’s wife Liz played for Lady Godiva in the late eighties. Liz played for another dominating championship team, Lady Condors, while living on the West Coast. When I returned to pick up their furniture several weeks later, I got to meet Liz. It was fun talking for a few minutes about Ultimate and some of the local people we mutually knew. I think it’s safe to say that this was the ultimate Ultimate estimate of my upholstery career, as of yet. The frisbee is made by WHAM-O and is not generally used in Ultimate, although the term frisbee is often used in association with Ultimate. The disc of choice is the 175 gram “Ultra-Star” made by Discraft, usually custom designed with team logos and art. Woods Hole Ultimate Frisbee (WHUF) offers year round pickup and tournaments in the Falmouth and Mashpee area. Check my “Links” section for more info. I usually make arm covers for all the upholstered furniture I do. Sometimes people ask me to make them, but most don’t ask me and I make them anyways. Seems like making arm covers is something upholsterers just do. How many of you reading this want your upholsterer to make arm covers for your upholstered furniture and actually use them? How many of you want them, but don’t use them? How many don’t want them? Please read and respect my copyright notice.